"Do you want to have lunch now, or farther down the road?" Walt asked. We had stopped for gas in Morgan Hill, which is one of the places where we sometimes stop for lunch. If we don't stop there, the next choice is the Burger Queen in Greenfield and if we pass that there's the weird little cafe in King City. Pea Soup Anderson's was too far away. We are nothing if not consistent. It was already 1 p.m., so I decided we might as well eat where we were. "OK," he said. "In 'n' Out, McDonald's, or Denny's." I chose Denny's, but he pointed out that it would take longer at a "sit down restaurant." So I chose McDonald's, and confessed my dirty little secret--that I didn't really like In'n'Out all that much. We pulled out of the gas station and as we were making a u-turn, I saw a sign for "Five Guys." This is a place I hadn't heard of much until yesterday, when the Today Show did a report on the top favorite fast food burger places in the country. McDonald's was at the bottom, Habit Burger at the top, followed by In'n'Out, and third was Five Guys. 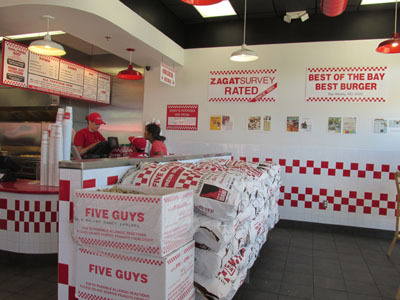 I didn't know that I had ever seen a Five Guys before and I suggested we be daring and try something new. They had me at "peanuts." You walk into the place and the first thing you see are peanuts in the shell. Thousands of peanuts. Sacks and sacks and sacks of peanuts, standing up, making a wall in front of the ordering desk. At the end of the sacks is an open box of peanuts, little boxes to take your fill, and shells on the floor, which let me know we were invited to toss the shells as we ate. I was impressed with the menu, which gave a price for the basic burger or cheeseburger, but all the toppings were free. So I was able to order grilled onions and grilled mushrooms and it didn't cost more than just a plain cheeseburger. Walt ordered mushrooms, tomato, lettuce, and A-1 sauce. The burgers were the best I've ever had at a fast food joint. And I learned that a regular cheeseburger is much more than I feel like eating, so next time I'll order their baby burger. You could order either regular fries or Cajun fries and Walt went with a small order of the Cajun which was about 4x larger than the large fries at McDonald's...it filled the cup designed for it, and then the bag that they put the cup in. I also liked that on the wall they posted the name of the farmer who grew the potatoes they were cooking today (may be just a weird gimick, but it felt folksy). 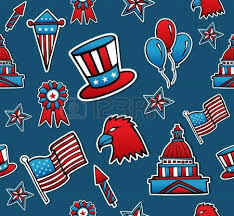 While I waited for Walt, I observed that there were a lot of Very Patriotic folks in this place on the 4th of July. 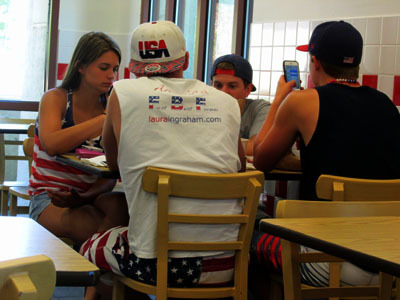 The shirt on the back of this guy advertises Fox's Laura Ingraham and above her web site address it says "First ... Best ... Forever." I was happy I had not worn my Obama shirt. So I'm a Five Guys convert. I don't know if I've ever seen a Five Guys burger joint anywhere before this, so it's not likely that I will be eating here often, but you can bet your bottom dollar that Cochran Rd. 's McDonald's has seen the last of us. 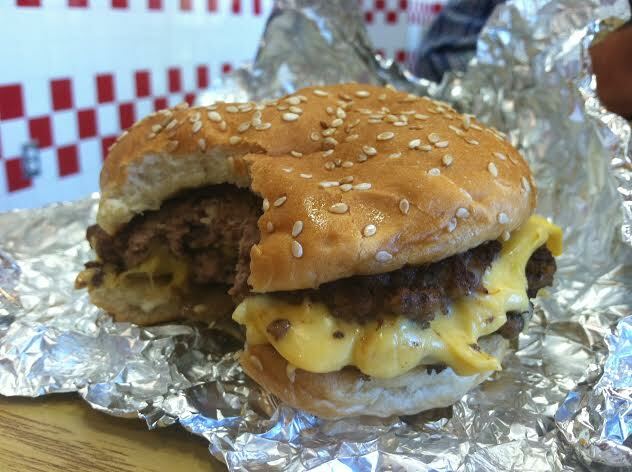 It's Five Guys all the way after this! Day 4: I loved this burger!